Join us for A Day with the Photo Detective. Maureen Taylor is returning to Northern California and bringing her blend of photo curation, genealogy, and history. 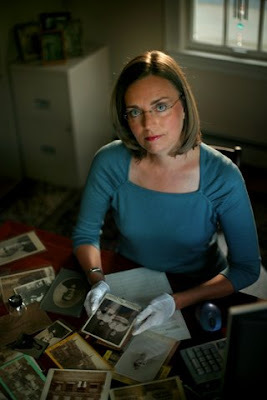 Visit our event site – A Day with the Photo Detective – for full information and the link to our registration page. Register by May 6, 2012 for the early bird price – just $48 to attend this all-day event. The price includes lunch – sandwich & salad buffet – with vegetarian choices. After May 6, 2012, price will increase to $58. Please invite your friends – you don't need to be a CGS member to attend! In the four years since Maureen was here, she's written several more best-selling books and her most popular titles will be available for purchase at the event. Maureen is also offering a limited number of photo consultations to seminar registrants. Consultations will take place the day before the seminar on Tuesday, June 5, 2012, at the California Genealogical Society Library in Oakland. They are by-appointment-only and must be scheduled in advance with Maureen Taylor. Visit CGSphoto.weebly.com for more information. Twitter followers, the hashtag for A Day with the Photo Detective is #CGSphoto. Please track our event on Lanyard.com or let us know there that you will be attending!